My son is nearly 5 and we had never taken him to visit an art museum before now. He has been to theatre shows and he has visited war and science museums. He has always exhibited remarkable patience and curiosity on these occasions, and been full of questions about everything. I was however, a tiny bit sceptical about how well he would receive art. Would he find it interesting? Or is art appreciation too much to ask of a small child? I need not have worried at all, as our recent visit to the Van Gogh Museum in Amsterdam proved. We visited late in the afternoon on a wet and grey Friday, hours before flying back home to the UK. While M was checking in our coats and backpack in the cloak room, J and I had a little nosy around the ground floor gift shop. It was love at first sight. My son saw a canvas replica of Van Gogh’s Almond Blossoms, and was instantly smitten. I don’t know if it was the beautiful blue or the dainty white blooms dotted all over it, but he promptly declared it to be his favourite painting ever. We grabbed a quick bite to eat in the first floor café, posed for the obligatory photos with a giant wall mural of the Sunflowers and then set about admiring the art. But not before I had grabbed a treasure hunt/quiz sheet for J to complete as we went around looking at the paintings. My son loves a challenge, and the quiz sheet provided just that. It held his interest for the next two hours and we both learned a lot about Vincent Van Gogh, his life and his art. Like how he practiced self-portraits and ended up with over 30 of those. And how he loved to portray simple country life in his drawings. I have always admired The Impressionists and Monet is a favourite. I am no art critic, but I could see the difference in style, strokes and execution between the artists. To me, Van Gogh has a bolder brush stroke - lines and dashes as opposed to points and dots. The colours are more vibrant. He tends to use a lot of swirls. It may be me, but I imagine the whirls got rather more pronounced in his later paintings, almost as a reflection of his mental state at the time. We ended our museum tour with another replica of the Sunflowers. You are allowed to touch this one, even photograph it. I knew it wasn’t the real thing, but touching those brush strokes was an experience like none other. I would love to visit the Van Gogh Museum again with my son when he is a little bit older. Then, it will no longer be about doing a quiz and following a trail. 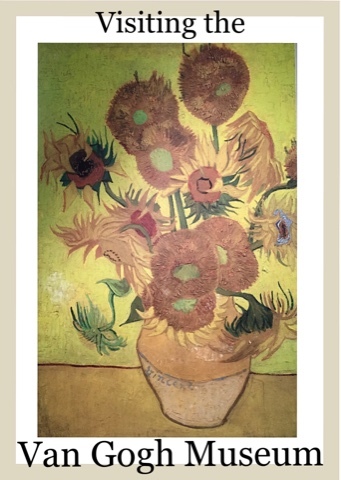 It will be about reliving Van Gogh’s artistic vision. 1) You can pre-book your tickets to the museum online. This will grant you priority access without the need to queue. 2) You do, however, have to choose an entry time at the time of purchase. Your tickets are valid only on your chosen date and time. You can enter for up to 30 minutes after your reserved starting time. 3) It tends to be quieter in the late afternoons after 3pm. So try and plan your visit around that time. 4) You do not need to print the tickets. Just store them on your mobile phone and present them at the entrance. 5) Children under 18 go free. So this is a fantastic opportunity to introduce them to art. It also gives you something to do on a rainy day in Amsterdam. 6) Pushchairs are available to hire from the cloak room. 7) You can check in coats and bulkier bags free of charge in the cloak room. 8) The museum is open late till 10pm on all Fridays with music, cocktails and free guided tours. So if you are looking for some quality time grown-up, this could be for you. 9) There is a café on-site that serves delicious healthy food and drinks. No chips, but lots of fresh fruit smoothies, pastas and cake. 10) The museum organises children’s art workshops on specific days. There is a charge to attend these. 11) You can pick up a treasure hunt sheet or Vincent’s Travelling Case for free from the first floor information desk. This is a fun way to get your kids interested in the art on display. They get a sticker on completion of the quest. 12) You can hire a multimedia guide for a fee or download the free mobile app for more information on the paintings displayed in the museum. 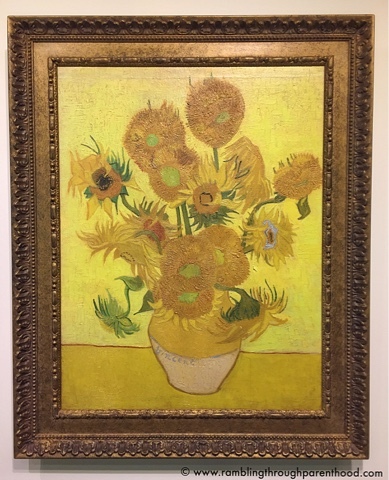 So, would you like to visit the Van Gogh Museum the next time you are in Amsterdam? Will you be taking the kids along? I'm always put off Amsterdam by the seedy side of the country but architecture and art always looks amazing. Ah, it is sad that 'Amsterdam' conjures up that image. There is so much to see and do as families, really. We don't give enough credit to our children, sometimes :) I think they can appreciate a thing of beauty when they encounter it, no matter what their age. A quality that should be honed early on, imo. I would definitely recommend a visit. It is such a fascinating experience. I agree, Jessica. Kids are like sponges; they will soak up everything they are exposed to. It is vital to create those memories and experiences for them. I haven't got children but I'd definitely like to vist Amsterdam and the Van Gogh museum myself. There is so much to see and do, I can definitely recommend a visit. It's quite an amazing experience, Sarah. Each piece created with such passion, each work with a story to tell. I've been there twice! Love Amsterdam! I have to say there was less stuff to see when I was there last year than my first visit in 2010... :/ Maybe it was just me but the top floor used to feature more non-Van Gogh artworks. It was our first visit, so have nothing to compare the layout to :) It was nevertheless a great experience. Oh I've never been but I'd love to! My dad always tried to open our minds to art and museums and stuff. He'd take us on "mystery trips" - one time I ended up in a vase museum. Wasn't as fun for an 8 year old!! I like the sound of a mystery trip. Might try that the next time we go exploring a new place. I love museums, they're first on my list when I go travelling, thanks for sharing this. I love the history of art!